I didn't want to say anything because who am I to tell you what to do, but that's exactly what I was thinking too. Recaps are fairly common culprits in blowouts from what little I know and it would be an obvious safety hazard to put them on the steers. Especially for an old beauty like that, I could just see the entire front end getting mashed because of a steer tire blowout. Thanks for the response to a fairly personal question . The Mack is looking great! Awesome stuff Wreckerman. I was always a Mustang fan too. The Ultraliner sure looks sweet with the wide base steers. I don't know anything about Ironman tires.....but those are an exact copy of the Bridgestone M844's I have always run. They are the best I have found in the winter. Don't hydro-plane in slush like the Good Year 286 and 296's. I know very little about tires, but I knew I wanted the fattest ones that would fit and a blend between good quality and not breaking the bank. These have been good so far, but we’ll see as time progresses how they hold up. I wasn’t really looking for a Mustang, I just saw this one and being a diehard Ford guy, I was able to save it. Maybe one day I’ll take it to some shows. Anyway, here’s a shot of the Mack all polished up and the Diamond Reo at the ATHS Show. A few people wanted to know if I was going to unload the Reo... considering it has no engine, transmission, or driveshaft, it stayed on the trailer. Maybe one day it’ll run but getting the Mack done, and then the Autocar comes first. Hopefully going to get some body work done on the Mack, especially to the passenger side fender, it’s held together with tape, so looking to fix and paint it to match the rest of the truck. I’d like to get as much work done as I can in the next few months, I’d really like to take it to the Kenly 95 Show and the Charlotte Diesel Super Show next year. Also looking for some input; should I get a brush guard made for it? I’m looking at Mik-Mak and Truck Defenders now, just kinda want something more between me and any animals or things that get in the way. There’s a lot of deer where I live, and I’d hate to end up with a busted up front end, because parts would be nearly impossible to find. Looking very good! You have a nice collection of stuff. I know the value of a moose bumper (what we call them up here.) Just don't know if I care for that look on a cabover. But I can tell you Mik-Mak makes the strongest on the market. I know they stand up to hit after hit against moose. And their mount plates are strong enough to withstand towing. Yes they are a pain as they have the two eye bolts that have to be screwed in and out to open and close, but the brands that have the one handed latch all start to rattle after a while. The Mik-Mak is always tight. I've had them on many trucks. Well, I have recently learned more about the Mack’s history, so here’s the story. On 12/30/17 I was moving some trailers around at the shop, and just happened to temporarily park the MH where the sun hit the door just right allowing me to make out some of the old decals on it. Turns out it was Truck #434 for Miles Trucking out of Ridgely, Maryland. From what I gathered, the company ran into some issues and auctioned off equipment, including my MH. I’m guessing from there it went to the dealer in Virginia that I bought it from. Anyway here’s what it looked like before I got it. I’m extremely happy about finding this little bit history on it, I had honestly expected to never know any history about it. I’m pretty sure that it was not purchased new by this Miles Trucking, so I’ll continue searching for info about its heritage. That's pretty cool that you got to find out a little history about your Mack. I agree with Charlie, it's definitely cool to find out some back history on your rig. 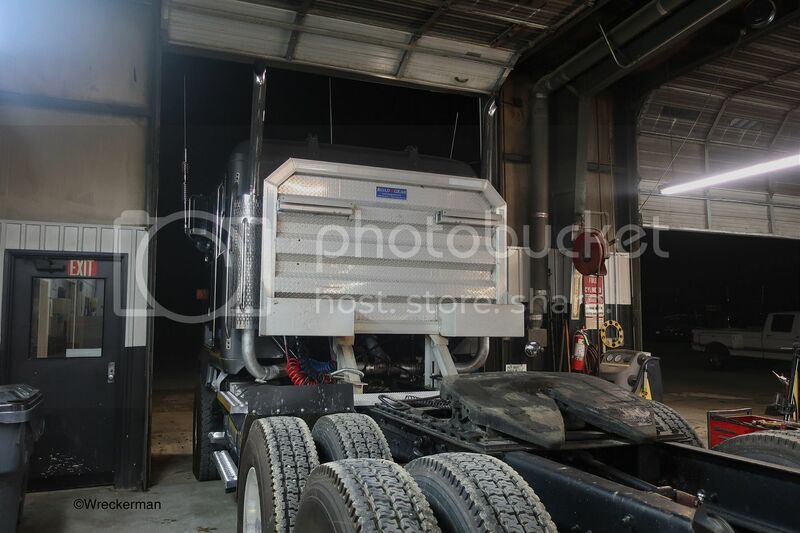 Also idk if you've put a guard on your Mack or not, but I speak for myself when I say I prefer the clean look. Can't object to wanting to protect your truck from some eventual roadkill though. I do believe I'll skip the guard, and probably eventually get a nice Texas bumper made for it. The rack looks a little rough but we got it cheap years ago, and never used it. I'm not positive I'll leave it on there, but so far I'm liking how it looks and the protection it offers the cab. And of course I'll get it polished up as soon as I can. Anyway, I'm open to suggestions and opinions. Looks good, functional and better looking to me then the moose bars up front would be! I know they serve a purpose too but this looks good! NOOOOO!!!!! No Texas bumper! I think your truck looks perfect as is. Put some Bulldog mirrors on it and it will be perfect. Paystar, I've recently had a change of heart on what look I want to go for. I've decided to leave it pretty classic, Bull Dog mirrors, factory bumper, factory paint scheme, and maybe a little frame stretch, and leave it be. I'll need to restore the interior and I'll replace all the old interior and exterior lights with LEDs, but other than that I'll let a vintage rig be a vintage rig. Speaking of paint here's the idea I'm liking most. Obviously, this isn't my picture. 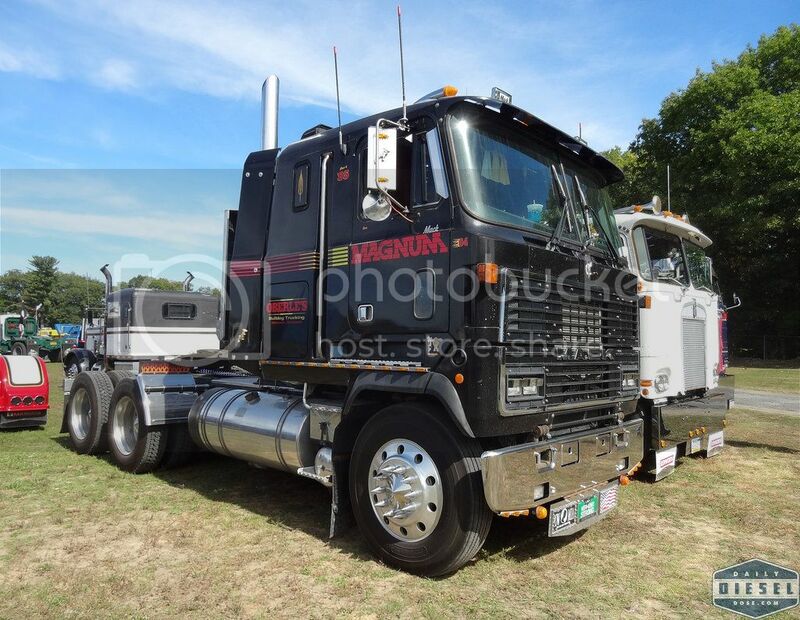 Anyway, instead of saying "MAGNUM", I would use whatever name I ended up using for my Mack. Regardless, I'm hoping for frame stretch and/or paint by the end of the year. It all is awesome but the frame stretch is not something you need to do IMO, I quite like that truck as it is , paint option is awesome and the return of the mirrors perfect!! It's your truck however, you decide, still cool to see it treated well!! 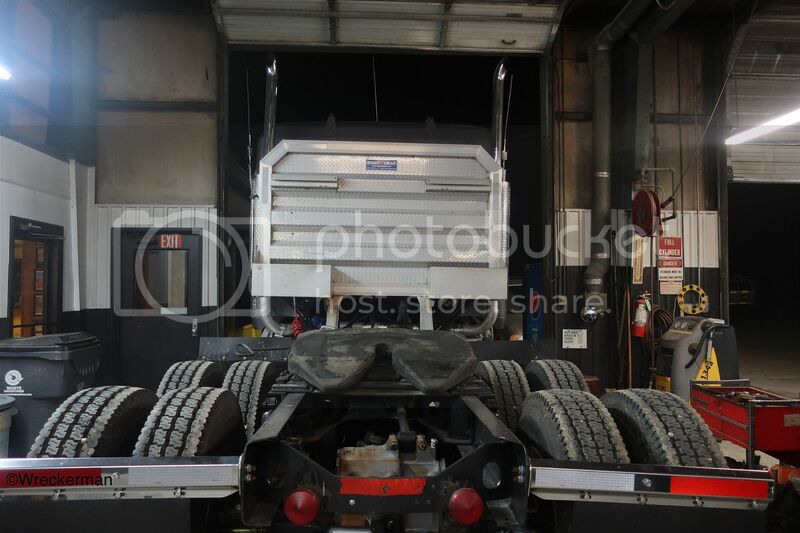 Drove the Mack to the paint shop last week. I'm planning on taking it to several Truck Shows around North Carolina this year, so I gotta get it looking better! Not going to paint the whole truck (yet), but getting a lot of body work and miscellaneous paint touch ups. I'm also getting some proofs from the decal shop on a few different things, I'm definitely going to try some type of decal, just as a test to see what looks good on it. 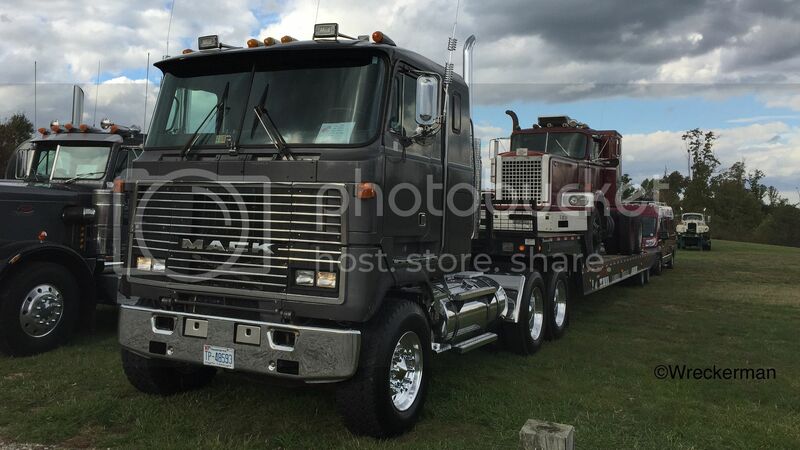 Anyway, I'm hoping to get it back about the third week of April at the latest, because there's a few Truck Shows in May I'm planning to take the Mack to. I'll post some pics as soon as I get it back, so stay tuned!